When I don’t wear makeup (specifically concealer), I get psychologically ready for all the “OMG, you look so tired” and “Dany, are you feeling okay?”. I’ve always been a heavy sleeper, I drink a lot of water, and I eat healthy – but no matter what I do, they are always still there. My dark under-eye circles. 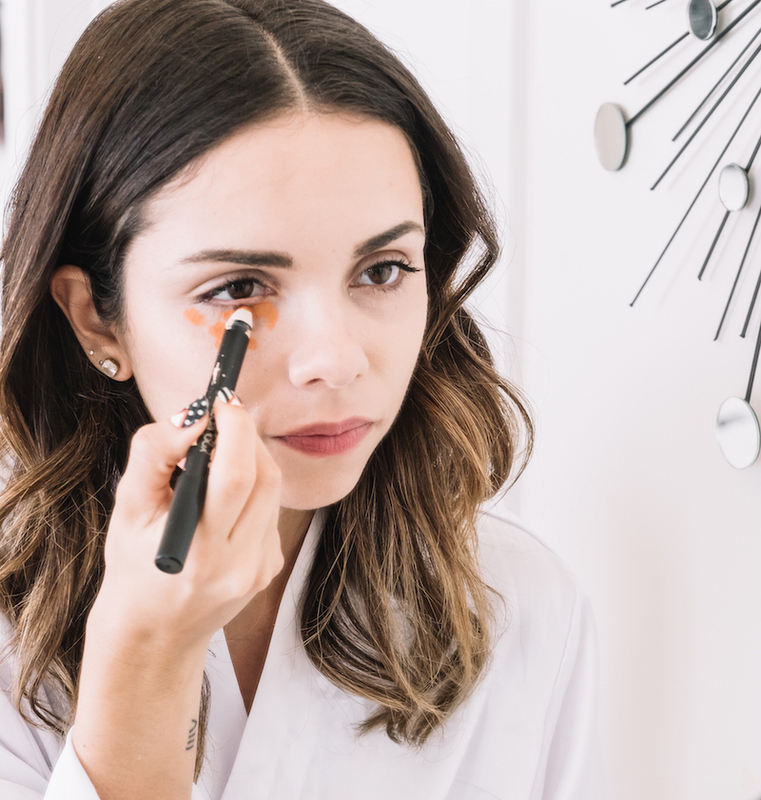 If you are like me and can’t live without concealer, here are some easy tips to fight dark circles, wrinkles, and puffiness instantly. There are many natural remedies you can try. My favorite is adding a thin layer of honey on the eye area before bedtime as it brightens your eyes overnight. Even though it’s an easy (one ingredient trick), it can be a little sticky. Reason why (head to #2), I recommend using a product specifically designed for the eyes. 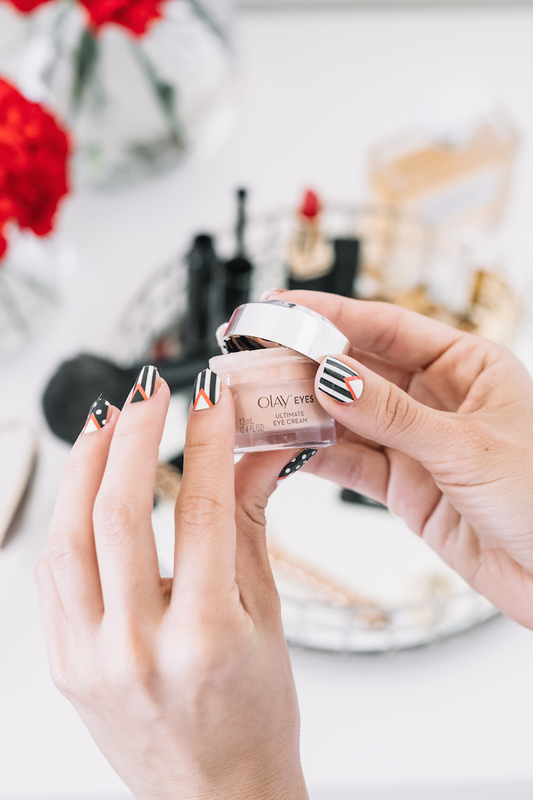 I’m super excited to tell you about the new Eyes collection from Olay…and I got to try it first, and I have to say: I think they created this product JUST for me! Okay, maybe not, but it feels that way. The New Olay Ultimate Eye Cream is a 3-in-1 De-Circler, De-Wrinkler & De-Puffer. It has an advanced color correcting technology that works on almost all skin tones to instantly illuminate eyes. Also, because of the peptides and vitamins, it renews skin surface to reduce the look of wrinkles (raise your hand if you are either preventing little wrinkles or trying to diminish them!!). You can use the Ultimate Eye Cream in the morning and evening after cleansing your skin. Massage a small amount around the eye area until it’s absorbed. When buying and applying concealer, take into consideration the undertone of your dark circles; some are blue, some are purple, some are purplish blue. Just like you learned in preschool, apply the color theory. By applying the complementary color, you neutralize the darkness. If your eye circles have blue and purple tones, you need a combo of orange and yellow – which equates to a salmon/peach concealer. Now apply it in a triangle/pie shape under your eye. Why? It covers the darkness while evening out your cheek at the same time. To minimize the dark under eye circles, avoid a harsh black eyeliner in the waterline. This only serves to emphasize and darken the area. What to do instead? Use a bronze or dark shadow with a smudge brush to define your eyes. Bonus – they are going to look bigger, too! Who would have thought that wearing your eyebrows more defined and thicker draws attention up and away from your under eye circles? It really helps! What are your tips and tricks for diminishing your dark under eye circles? The new Olay Ultimate Eye Cream is launching in July. BUT Olay is actually partnering with Allure for an exclusive pre-sale that you can’t miss RIGHT NOW. Plus, as a free gift with your purchase, you’ll also get the new Olay Pro-Retinol Eye Treatment (it helps to diminish deep crow’s feet). FTC: I have partnered with Allure and Olay to promote the pre-sale. All opinions are my own. I only partner with brands I truly believe and would buy for myself. you are so sweet! It's actually nail stickers from L.A Colors!! Great tips! Your nails look amazing, btw. Me encanta la manicura!! Muchas gracias por los consejos. Un saludo!! Me cuentas si pruebas alguno! Besos! El de Smashbox de la colección Liquid Matte <3 excelente! Siempre a la orden! gracias a ti por tu cariño!